Saturday marked the six-year anniversary of Bryce Harper's MLB debut. Today in 2010, Bryce Harper, with the College of Southern Nevada Coyotes baseball team, finished the season with 31 home-runs, while batting .443. He was then drafted two months later by the Nationals. Here's a look back at Bryce through the years. 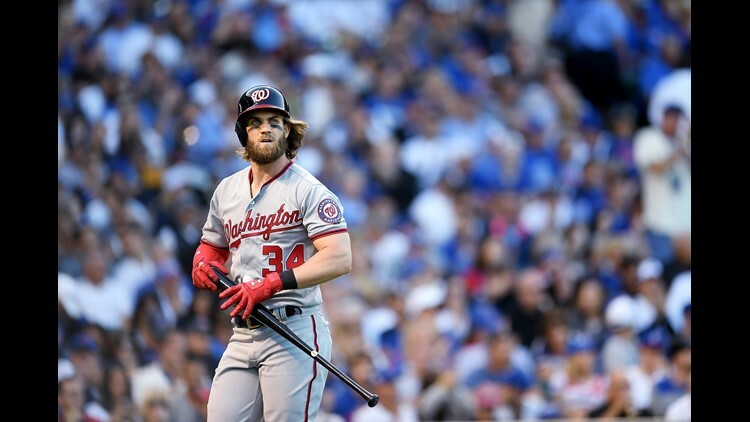 WASHINGTON, D.C. (WUSA) — Saturday marked the six-year anniversary of Bryce Harper's MLB debut. At this point in his career, Bryce is both savvy at the plate and often feared by opposing pitchers. A dangerous combination for the opposing team, which has made him the most walked man in baseball. He was walked intentionally Saturday by the D-backs and now has 35 walks, which leads the Majors by 11. In case you forgot about Bryce up until this point, here's a few highlights to jog your memory. 2009: Bryce's prodigious talent and mammoth frame made him a Sports Illustrated cover boy as a 16-year-old sophomore at Las Vegas High School. The cover referred to him as the "Baseball's LeBron James." Since 16 years old he has been meeting and exceeding exceptions, just like LeBron. Bryce may not have been as good as quickly as LeBron, but once it happened, it happened fast, and it’s here to stay. That same year, while competing in a high school home run derby, he smashed a 570-foot home run—with an aluminum bat—at Tampa Bay's Tropicana Field. The longest home run recorded in the ballpark's history. 2010: This day eight years ago, Bryce finished his junior year season with 31 homeruns, while batting an amazing .443. His selection by the Nationals with the No. 1 pick in the 2010 MLB Draft makes him the highest selection of any player drafted straight from an NJCAA member college. 2011: The hitting streak begins for young Bryce. After hitting a casual .399 in Spring Training, Bryce started his professional career with the Class A Hagerstown Suns. He would not stay there for very long. He struggled at first, hitting just .233 over his first 12 games, and then promptly transformed into the hitting beast he is today. 2012: The 19-year-old Nats' rookie makes his debut. 2013: Bryce's first walk-off homer, the rest is history! 2014: A home run derby in the NLDS. 2015: Six dingers, three days! You heard it. Bryce hit a still-mind-boggling .330/.460/.649 with 42 homers in 2015 (OPS+: 198), taking home the NL MVP Award at age 22. By this point, Bryce had already demonstrated a flair for the dramatic -- again, his first career stolen base was a steal of home. So, as he sat on 99 homers in April, it was clear that No. 100 couldn't be just any old dinger. 2017: A homer in every NL park for Bryce. Pretty surreal to make history at age 24, welp Bryce is surreal. Back on May 17 against the Pirates, he managed to check off a box on the career bucket list: Hit a home run in every current National League park. ICYMI: Bryce pelted a 112.6 mph HR that nearly left PNC Park last night. Also, this is the year of Bryce and the best helmet throw ever! 2018: No bat? No problem for Bryce. Nats' General Manager, Mike Rizzo has some kind words to share about Bryce. Nats' Manger Davey Martinez also has some words to share. The now 25-year-old outfielder will (barring the unforeseen) become baseball’s highest paid player EVER! This will likely draw a contract worth close to half a billion dollars during the free agency season of 2019, and he will play wherever he want. Hopefully still with the Nats? Guess we will wait and see! Cheers to many more years with the Nats' Bryce!